A weak storm will bring a little snow overnight and colder weather for Thursday. DENVER — A weak storm system is spreading light snow across northern Colorado tonight and early Thursday. Snowfall will be minor, just a few inches in the northern mountains and an inch or two over the plains north fo Denver. The heaviest snowfall will be near the Wyoming border with one to three inches near Cheyenne. Denver and surrounding communities will just see some flurries, with no accumulation expected. Roads may become slick along I-25 north of Denver, as well as Highway 85 and 285 across northern Colorado. Central and southern Colorado will miss the snow, with just some clouds expected through early Thursday. Temperatures tonight will be cold, with lows ranging from 0-10 degrees in the mountains and in the teens on the plains. Thursday will stay pretty chilly with highs in the 20s in the mountains and upper 20s to low 30s for Denver and the northeast. Skies will be partly cloudy across the plains, while some light snow develops over the central and southwest mountains in the afternoon. Friday will be dry in Denver and across the eastern plains, while a few inches of snow will fall in the central and southern mountain areas. Expect highs in the 20s in the mountains and upper 30s to middle 40s on the plains. 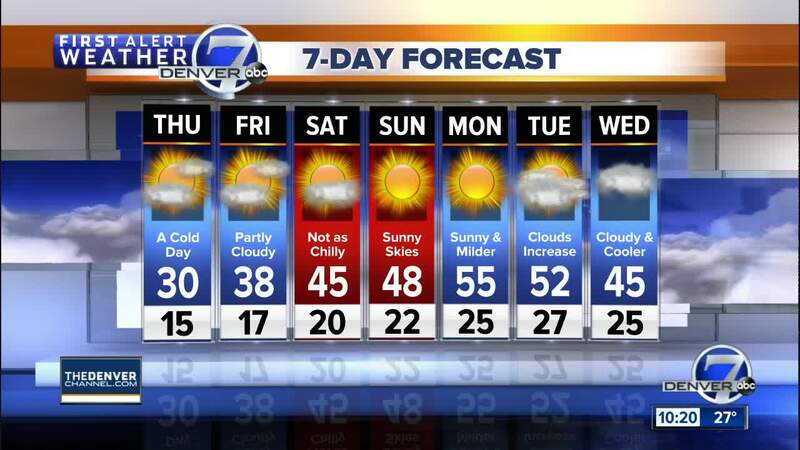 Temperatures will reach the low to mid-40s on Saturday in Denver and be in the upper 20s to low 30s in the mountains under a mostly sunny sky.